Florida Variegata is a beautiful Weigela variety that features pink and white flowers that bloom in profusion from April to June. This is a perfect garden hedging plant that can be used as large hedges with flowers. Weigela is a compact deciduous shrub with upright growing and bushy habit that are easy to grow and demand low maintenance. Also known as the French Lace, Weigela is native to North China and Japan. 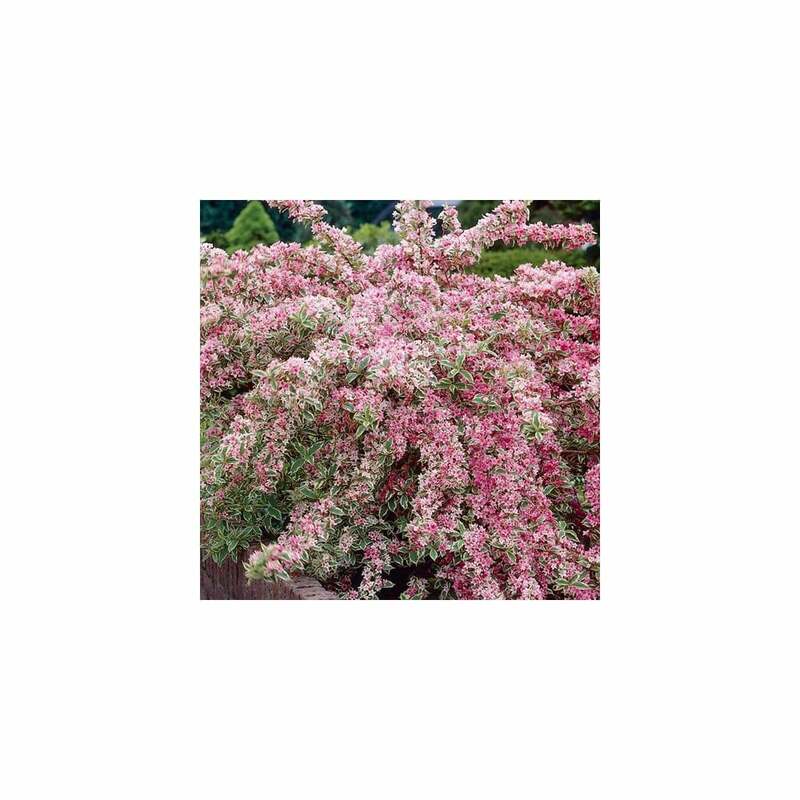 This beautiful flowering shrub will grow as tall as 3 metres. It produces stunning trumpet-shaped pink and white flowers that grow in clusters all spring and summer. These gorgeous flowers attract butterflies and hummingbirds, bringing wildlife to your garden. These flowers are backed up ovate green leaves that are margined with white, setting up a decorative contrast for the blooms. In mid-summer and late summer, one can experience repeat blooming, thus increasing the flourishing period. Plant Weigela Variegata in a soil that is moist and well-drained. These plants will adapt to any soil and prefer sunny positions in the garden. Let them receive full sunlight and watch how brilliantly the shrub will perform. Add a layer of organic mulch to retain moisture since its roots prefer cooler surroundings. These hardy plants are easy to grow and maintain. They need pruning to keep the shoots in proper shape and size. Prune right after the flowering period but avoid cutting old stems largely. Water them moderately when the plants are young. Florida Variegata look perfect in groups as border hedges. These are excellent dense hedging plants that can be used as decorative borders in city gardens, informal gardens and cottage gardens. Use them to brighten up dull corners of your garden.